KCARE is unswerving when it comes to issues affecting agriculture in our state, but we also recognize that Kansas has a lot to offer the rest of the world: expertise, experience and a strong tradition of extension work. Recently, KCARE Director Dan Devlin spoke with farmers, researchers and government officials in Ukraine about the success Kansas producers have had with specific cropping systems and how Kansas State Research and Extension supports agricultural production here at home. Dr. Dan Devlin with scientists at the Institute for Soil Sciences and Agrochemistry Research in Kharkov, Ukraine. It might be something we take for granted, but in countries like Ukraine, land grant systems and extension services don’t really exist. This is due to the country’s history. When the Soviet Union collapsed, the collective farming system also dissolved, leaving thousands of “owners” on each farm with little to no expertise about what they could and should do with their land. “We are who we are because of tradition,” Devlin explained to a group of Ukrainian government and industry officials in Kiev. This group of leaders wants to improve their country’s system with the help of experts like Dr. Devlin, who was able to present the history and overall organization of K-State’s extension efforts. He also discussed partnerships between producers and the university, researchers and county extension agents; Dr. Devlin also highlighted how KSRE works to get new technologies to producers. 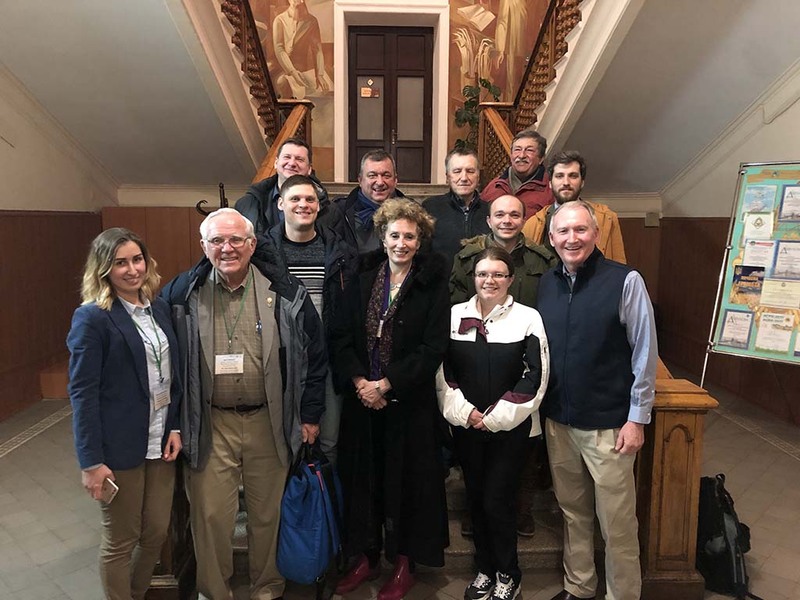 It is hoped that by using K-State’s model of teaching, research and extension, farmers in places like Ukraine will be able to reap the benefits of a successful agricultural economy. Read more about Dr. Devlin's trip to Ukraine on our Burning and Smoke Management page. Kansas has a rich history, and agriculture is at its heart. The technology and techniques of our current times have replaced the traditions from the early 1900s, but we still hold fast to the idea of partnerships: between neighbors, between researchers, between institutions. Partnerships are the strong foundation on which we build our successes. Read more about how urban–rural partnerships are increasingly viewed as a critical component of efforts to improve water quality at the watershed scale in a just-published paper. You can also learn about other projects in issues of our KCARE newsletter, KCARE Research Today, or link to our Publications page. Kansas State University established KCARE in order to coordinate and enhance the research, extension, and teaching activities that focus on environmental issues relating to agriculture. KCARE supports research spanning multiple departments and disciplines: soil science, smoke management, cropping systems, water quality and irrigation, fertilizer research, and climate studies. It is our privilege and pleasure to work with research and extension faculty, students, and members of our community to explore new ways to create quality solutions for the environmental issues our state faces now and into the future. Through our partnerships, we are helping Kansas agriculture remain successful and sustainable. Copies of the KCARE logo are available for interested stakeholders. Possible uses include as a link to the KCARE website on personal or departmental webpages, or on brochures or handouts including KCARE-supported research. Contact KCARE for more information. Want to learn more about the Kansas Water Resources Institute and the projects we support? Read the latest issue of KCARE Research Today, our newsletter.